The Dodo survives in The Gateway despite major construction hassles. If the road/TRAX construction that surrounds The Gateway doesn’t make it a nightmare to get to, it’s at least a very bad dream—but it’s not impossible. And I feel for businesses like The Dodo, located smack-dab in the middle of the madness on 400 West. I’m guessing they wish they’d never left their safe, successful, easy-to-get-to location on 900 East. But then, The Dodo has been around in one place or another for more than a quarter century, so don’t look for it to pass into extinction just yet. In fact, The Dodo has a thriving lunch business. Folks from the offices near The Gateway realize that it’s still an easy walk to The Dodo. Dinnertime is another story, where nighttime patrons find Gateway parking a major hassle. And it takes its toll on The Dodo’s employees. During a recent Dodo dinner, our server mentioned three different times that he was “looking for another job.” His tableside manner indicated that he’d already checked out of this one. On the other hand, at lunch last week, a server named Tana seemed more philosophical. “I won’t lie to you,” she said, “The construction has definitely hurt our business.” Still, she smiled throughout and provided terrific service, as it should be. Obviously, Tana’s in it for the long haul. These days, restaurants like The Dodo are an anomaly. Unlike its Gateway restaurant neighbors, The Dodo isn’t part of a chain or a franchise. And, unlike 99 percent of new eateries, it’s not a theme restaurant, either. I suppose you could call The Dodo’s menu “eclectic,” as it ranges from artichoke pie, Cobb salad and tuna melts to honey-baked salmon and hummus. I tend to think of it as an upscale diner, with a little something to please almost every palate. Take The Dodo’s baked cream cheese and crackers ($5.95), for example. Our table loved this appetizer, although I had ordered it just because it sounded so gawdawful: “Baked cream cheese, marinated in soy sauce, breaded with toasted sesame seeds. Served with apple and Asian pear slices and crackers.” I’ll never scoff at baked cream cheese again—although I was annoyed when we ran out of crackers, since the baked cream cheese easily feeds four as an appetizer. An extra serving of crackers is $1.99. Next time, I’ll just line my pockets with saltines before I leave home. The polenta cakes ($6.95) starter at The Dodo is just as robust: four good-size seared polenta cakes, stuffed with slivers of red and green peppers, with avocado sauce and chipotle aioli. Again, a dish easily shared by four people. In fact, the portion sizes at The Dodo are as generous as I’ve seen anywhere. I swear there must be three-quarters of a pound of pasta in each of the pasta dishes. We were still dining on leftovers from The Dodo’s scrumptious Cajun chicken Alfredo ($10.95) two days after we visited the restaurant. 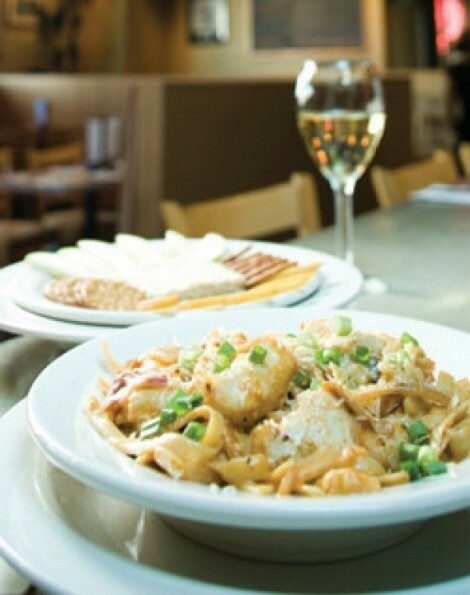 The dish reminded me of a subtle, luscious Alfredo-style pasta dish I had years ago at Paul Prudhomme’s K’Paul’s Louisiana Kitchen in New Orleans: creamy and light with just a teasing touch of Cajun spices. My stepson C.J. boldly ordered the chilled gazpacho soup at The Dodo—a mainstay of summer menus—and liked it as much as I did. Not bad for a teenager! I also found myself enjoying The Dodo’s beef Stroganoff more than I’d expected. It’s not traditional by any means: Sautéed beef tips over a hefty portion of al dente fettuccini, doused in a tangy red wine and paprika sauce (maybe just a tad too much paprika) and topped with sour cream ($13.95). It’s a shame that The Dodo’s wine list, if you can call it that, is so perfunctory: four acceptable whites and four reds, $5 per glass or $25 per bottle. I ordered a bottle of Cortese di Gavi Batasiolo and was told by our server (the guy who already had one foot out the door) that they were out of that wine; “Everybody’s out of it,” he said. Sadly, he couldn’t tell us anything about the remaining three white wines on the list nor if they actually had them on hand (they were out of a second, also). With only four reds and four whites to deal with, how difficult could it be for a server to get a grip on that wine list? It seemed as though that our server also needed a refresher TIPS course, since I was encouraged to guzzle the remainder of my glass of Monkey Bay Sauvignon Blanc before he’d set down the glass of Lulu B. Pinot Noir I’d ordered to drink with my Stroganoff. Our enlightened Utah Department of Alcoholic Beverage Control wisely abolished the silly “no two wines glasses on table at one time” rule a couple of years ago. Tana’s far-superior service helped make a Dodo lunch a joy. The caper-spiked tuna melt at The Dodo is a classic, and I also very much enjoyed my Reuben sandwich, made with home-cooked corned beef and Swiss with Dijon mayo on crispy grilled swirled rye bread. My only gripe was that the quality of the sauerkraut didn’t approach that of the other sandwich ingredients. Why don’t restaurants make their own sauerkraut anymore? On the other hand, the home-style potato-leek soup I ordered, with hearty chunks of spud, was as good as any that Mom ever made. So don’t let those mean streets get to you. The Dodo is a classic enclave worth finding a parking space for. At the Summer Fancy Food Show in New York City earlier this month, Liberty Heights Fresh owner Steven Rosenberg and his market were awarded the outstanding retailer 2007 award by the National Association for the Specialty Food Trade. They’re also featured in the current issue of Specialty Food magazine. “I think that passion for authentic food is in my DNA,” says Rosenberg. Liberty Heights Fresh offers specialty groceries, cheeses, charcuterie, fresh flowers, artisan breads, organic dairy and more and is open Monday-Saturday at 1290 S. 1100 East. Its phone is 58-FRESH. One of my favorite Park City haunts is The Spur Bar & Grill. The no-smoking private club has always had killer bar food, and now, chef Michael LeClerc has created a full dinner menu for The Spur featuring what he calls cowboy cuisine. Among The Spur’s new cowboy cuisine offerings are ancho-chili corn cakes, grilled buffalo ribs, roasted adobe chicken, red chili hominy soup and skillet-roasted Angus Beef ribeye steak. The Spur also sports an extensive beer and wine selection, not to mention live music nightly. The Spur Bar & Grill is located at 350 1/2 Main Street next to its sister restaurant 350 Main Brasserie in Park City, and its phone is 435-615-1618. The next time you’ve a hankering for potato salad, you must check out Don’s zappy potato salad at Moochie’s. I’ve never tasted better. I’m not sure exactly what ingredients Don uses in his tater salad, although it does seem to have approximately 78 times the amount of black pepper of any potato salad I’ve previously encountered. It’s good stuff. Moochie’s Meatballs and More is located inside Circle Pottery at 232 E. 800 South, and its phone is 596-1350. Quote of the week: It’s bizarre that the produce manager is more important to my children’s health than the pediatrician.